Back when I started this marathon, I took on Sword Art Online as one of three series to start with. It impressed me quite a bit, which led to it being the first review of the marathon. It's only right that the special (that came out just a few days ago) would kick off the 2014 segment as the series kicked off 2013 before it. I'm back after a brief hiatus. This review marks the launch of Anime Marathon 2014. I'll continue to bring you guys reviews of everything I watch for as long as the community wants it. Thanks for keeping me around for another year! Sword Art Online: Extra Edition is a ~100 minute anime movie/special set after the titular series. In actuality, the majority of the movie amounts to a recap of the events of the series. Don't write it off yet though! I'm not finished here. The framing plot here is that Kirito and company are back in the real world and everyone is recounting stories from inside the game. Keiko (Silica), Rika (Lizabeth), and Asuna (Asuna, oh wait...) are all exchanging stories on how they met Kirito while helping Suguha (Leafa, Kirito's sister/cousin/whatever) learn to swim at the pool. Obligatory fanservice episode: check. Meanwhile, Kirito is dishing out stories of his own to a government official, recapping the major events of the series. The last twenty minutes or so actually consist of all new footage so don't fret! The framing plot for the special isn't that bad really. They're going on a quest in game that requires them to go underwater, so Suguha needs a bit of help with that (she can't swim). It gives the movie an excuse to have the girls exchange stories of the series and manages to tie the whole thing into the eventual "plot" of the episode. After the recap portion is done, we get treated to a bit of in-game fun as the crew (including Klein and Agil) group up to take on a big quest that is shrouded in mystery. There's a bit of action that happens to be well animated and the whole thing is a nice break from reality. During the recap part, we're treated to a whole bunch of fun lampshades and Easter eggs too. For example, the movie goes and points out why Kirito took on the title beater and why it was important. The subtext was enough but it is nice to hear it actually said out loud. Fun callbacks are probably all over the place, although only a couple come to mind for me. Asuna's cover-up at the pool very specifically invokes the feeling of her in-game Blood Knights armor. It isn't important, but it is a fun callback. Personally, I like recaps as long as they aren't overdone. It was a good recap of the series that managed to also have its own story to go along with it. One of the things I thought was lacking in the series was the lack of real world interaction between the players. We never really get to see them get together and just talk about what happened. That sort of thing is good for establishing characters. This movie tries that a little bit. As I said, the girls gather up and comment on each other's stories. It's just fun and full of character moments. The character moments also serve to establish the supporting characters Silica and Lizabeth a little bit. They both don't get enough screen time, so it was welcome to see them getting in on some character development. Another example, that one bit really early in the special where Asuna said "Kiriiiito-kun" (with a smile no less) did more to establish her character and their relationship in the real world than I thought possible in the short span of a few seconds. Pretty much a really big breather episode, there isn't much else here. It isn't advancing the overall plot of Sword Art Online at all because it's self-contained. There's fanservice, recaps, and a simple framing plot that doesn't change the overall plot and nothing else. There isn't much else to say. It is forgettable in that it doesn't do anything important. The Extra Edition is a good attempt to prepare the audience for the oncoming Sword Art Online II, which was announced at the same time. This is because it does exactly what it should: it recaps the big stuff, reminds us of some of the small things, and introduces all the characters again. Generally speaking, it isn't very vital to watch it before the next season, but I'd certainly recommend it. The writing and plot are pretty good considering it's a glorified recap episode. There's fanservice and character moments alongside the nice plot. This is best for someone that liked Sword Art Online that just wants a little fix between now and the sequel series. It's completely self contained and just has a little bit of fun instead of being dramatic. It does a little bit of hinting at the next series, although this is at the very end and it isn't much. You can probably get away without seeing any of it when the series comes out and not notice a thing. A good movie though. It is worthy of a quick watch on a slow day if you're in the mood for some Sword Art Online. 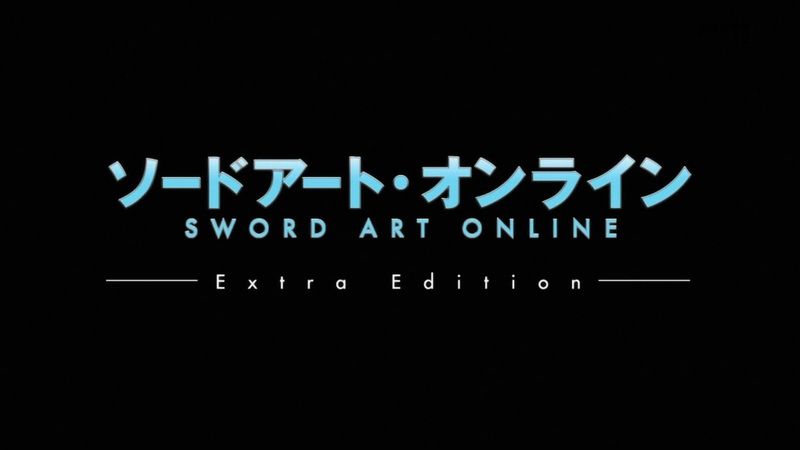 You can watch Sword Art Online: Extra Edition on Crunchyroll. I'll probably do Code Geass next time.